Notifications are short messages about important events or tasks which appear automatically in popup windows in lower right corner of the screen and are also displayed in the website heading. 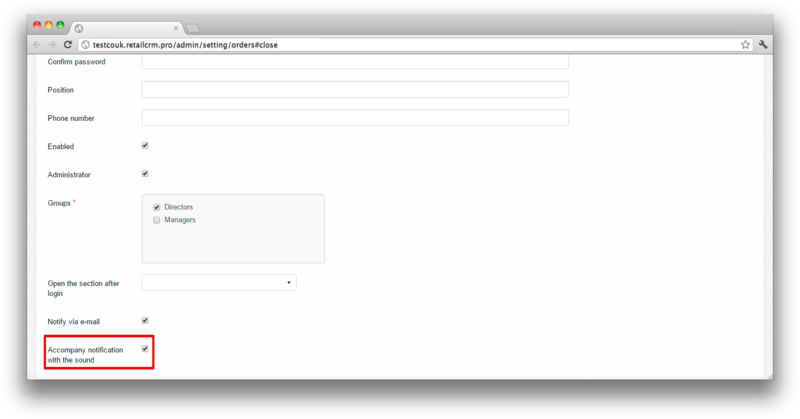 Also the user getting notification on events in system, receives it via email. Manager needs to process inquieries quickly. That’s why when the load is heavy he can leave next coming inquiery unnoticed. Visual notifications implemented in system will help manager to respond the inquiery fast and show high level of service. Read about task notifications in section Tasks. To create onetime notification for a certain group of users press button “Create notification” in notification list in system interface heading. 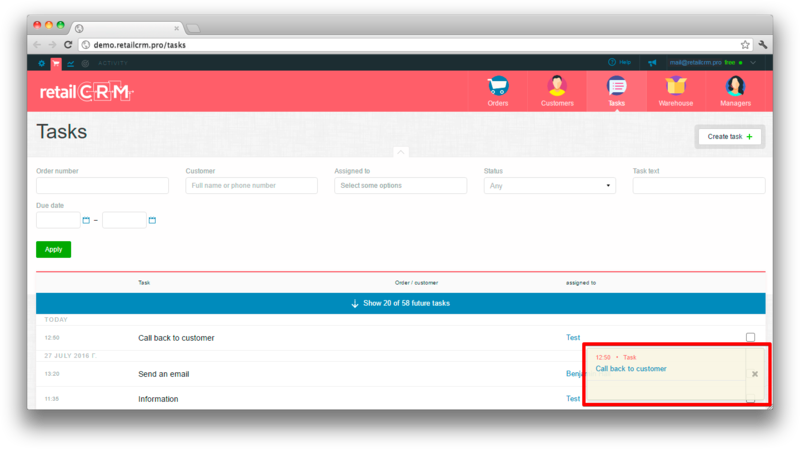 A simple form for sending onetime notification will open. It will be available for the chosen usergroups. Letters with your message will be sent to chosen user group emails. Such notifications are system ones and they come as by adding new order/customer, as well as by changing order/customer information. These notifications can be turned off and on. 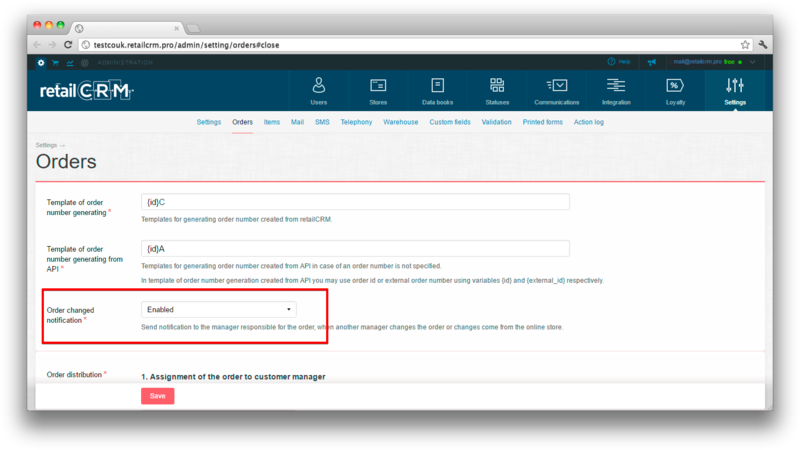 Read about this setting below in subsection Setting up system notifications. 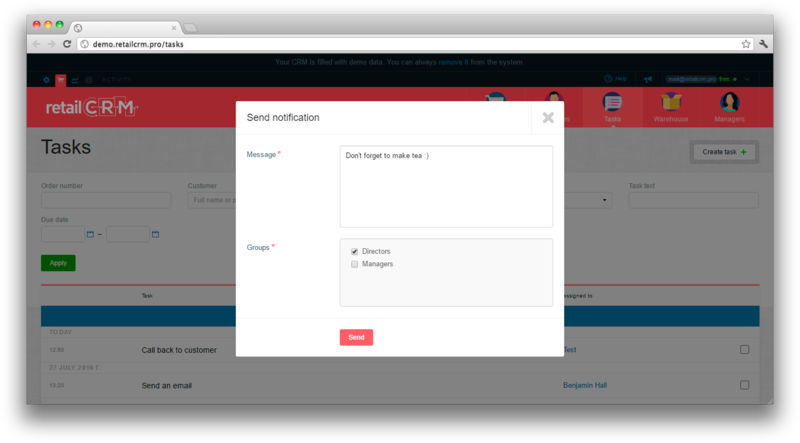 Custom notifications can be created as part of trigger setup rules on letter or sms sending or manager reminder. For more see in subsection Notification template creation. Note: group closure of notifications is available. Made by holding “Shift” when closing. If there are several system tabs open, notifications appear only in active tab. If all tabs are inactive, notifications appear only in one of them. When notification appears in inactive tab, a notification in Favicon and tab heading appears. In order to turn on “Notification sound” setting you ned to go to section «Administration» with the help of «gear» icon in left upper corner, then go to «Users», «Users», tab and follow the link to the specified user card. 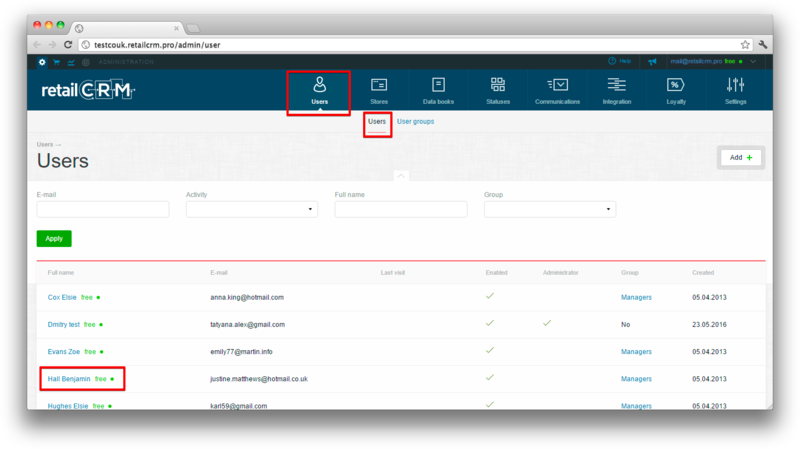 In user card you need to tick the box “Accompany notification with the sound”. If this setting is set up, popup notifications are accompanied with the sounds: one for usual and another for important. 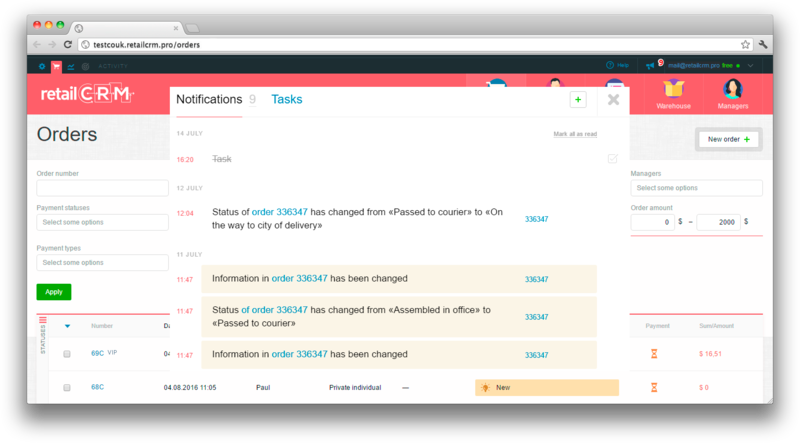 Important notifications are the ones with expired orders, tasks, time of which has already elapsed. Usual notifications - are notifications about other changes in the System(for example, notifications about order status change). In “Communications” section there is a tab “Notification templates”. This tab displays list of your templates for notifications. This list can be filtered by event or by activity. In our case event is understood as change in order or in customer. Read about how to create notification template in section Creating notification template.